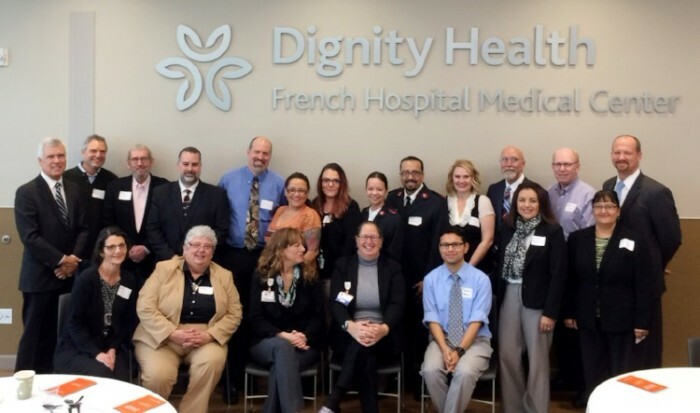 Uninsured or under-insured residents in north SLO County got a boost January 9 from a generous Dignity Health grant. PSHH President/CEO John Fowler and Director of Neighborhood Development & Resident Services Rick Gulino were on-hand to receive a portion of the collaboration grant that will expand free health services provided at the clinic offered at PSHH Canyon Creek Apartments in Paso Robles. Started in May 2017, the clinic provides free cancer screening, primary care, reproductive health, pharmaceutical, and social services in partnership with SLO Noor Foundation, Planned Parenthood, Alliance for Pharmaceutical Access (APA), and Hearst Cancer Resource Center. The Dignity Health grant will allow the clinic to expand its hours from one day a week to six. SLO Noor’s services will expand to three days and week and Planned Parenthood, a new clinic partner, will begin offering services three days a week. SLO Noor Foundation offers a broad range of free healthcare services for uninsured adult residents of SLO County. In addition to a Primary Care Clinic and a Vision Care Clinic in San Luis Obispo and the partnership at PSHH’s Canyon Creek Apartments clinic, SLO Noor Foundation has partnered with PSHH for four years to offer a free, public dental clinic at The Villas at Higuera Apartments in San Luis Obispo. Through its San Luis Obispo Center, Planned Parenthood California Central Coast offers reproductive health services, education and advocacy for insured and uninsured residents. The Alliance for Pharmaceutical Access (APA) is a medication access and advocacy resource center that provides life-saving medications to low-income individuals who otherwise might go without treatment due to cost. APA provides services to residents of San Luis Obispo County and North Santa Barbara County. The Hearst Cancer Resource Center at Dignity Health’s French Hospital Medical Center in San Luis Obispo, CA, offers comprehensive care by expert doctors, cancer specialists and highly skilled nurses.